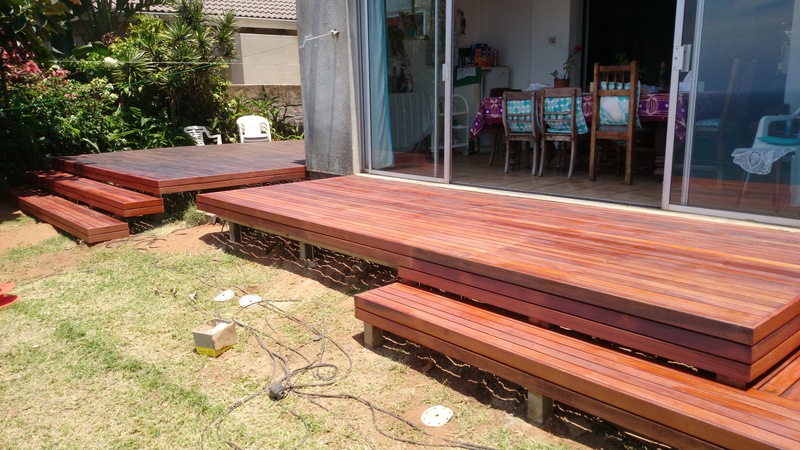 This wooden deck in Durban was the second phase of a job we started at the beginning of the year. We were originally asked to build a deck off the main bedroom. First we had to remove the aluminium window and install an aluminium sliding door. I always suggest that clients do this first so that we can build our wooden decks perfectly flush to the new opening. We had various obstacles to overcome. There was a septic tank that we were building on top of so we had to leave sufficient space and a large enough trap door to access all three tanks. We built one large trap door so that the whole thing could be taken off to access these tanks. During our build a new soak away had to be built as the old one had packed up. With all of this out-of-the-way, we could continue with phase two which was to complete the main deck with two steps off the front edge leading to the garden and a new second deck in front of the sliding doors to the lounge. 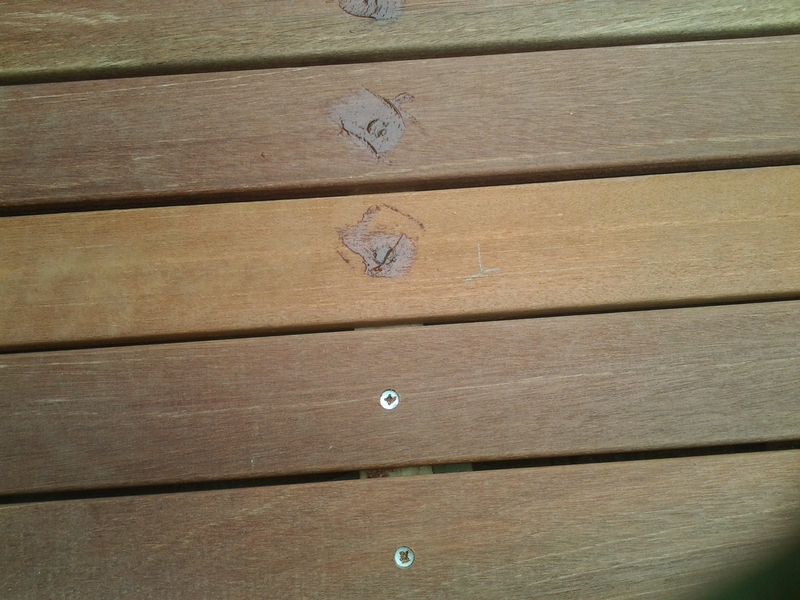 This second deck had a corner step similar to the other deck. 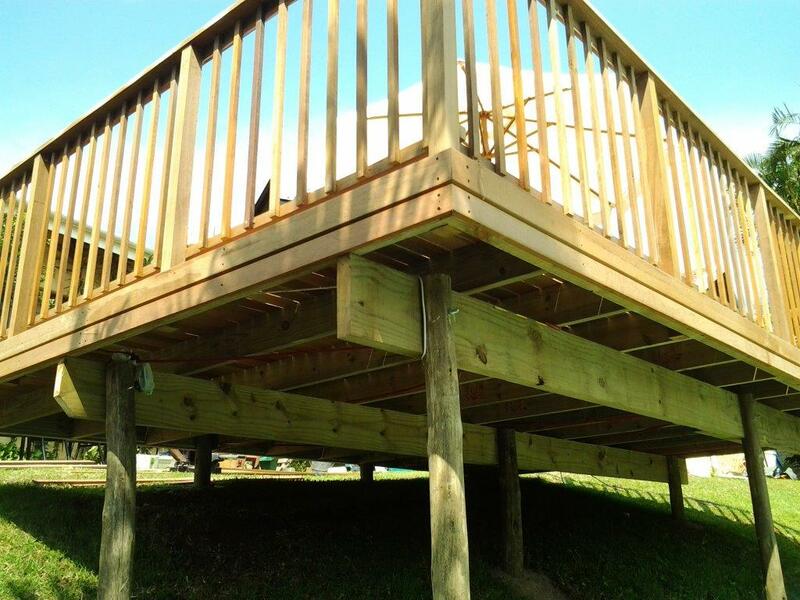 These steps were the full length of the deck and had closed risers and treads. In order to build one of these you must basically build a second substructure in the same way as you build the deck substructure in order to span your deck boards across them. So each tread has two beams and joists and is then clad with deck boards. I can clearly remember building our first one which took ages because we tried to build each joist individually. We’ve since learned that with smaller structures one can build a frame and then pull it into position and attach it to the main structure and then clad it. Much quicker, much easier and a lot more accurate. This was our final job for 2013 and we lost one day to rain which set us back a day and we had to spill over into the weekend. We had originally planned to finish on the Friday, but we had to come back on Saturday morning to seal it. The original deck we built earlier on in the year had greyed already from the sun so we had to sand it quite a bit to get it back to its original colour for the two to match. difference between balau and CCA pine is huge so we can keep our rates down to our clients and the H3 CCA pine will actually outlast the balau substructure. We still use balau as deck boards and balustrades simply because it is a lot more attractive and more stable so reduces cupping, bowing and checking. In the substructure, because of the size of the timber it is not as important to limit cupping and bowing. 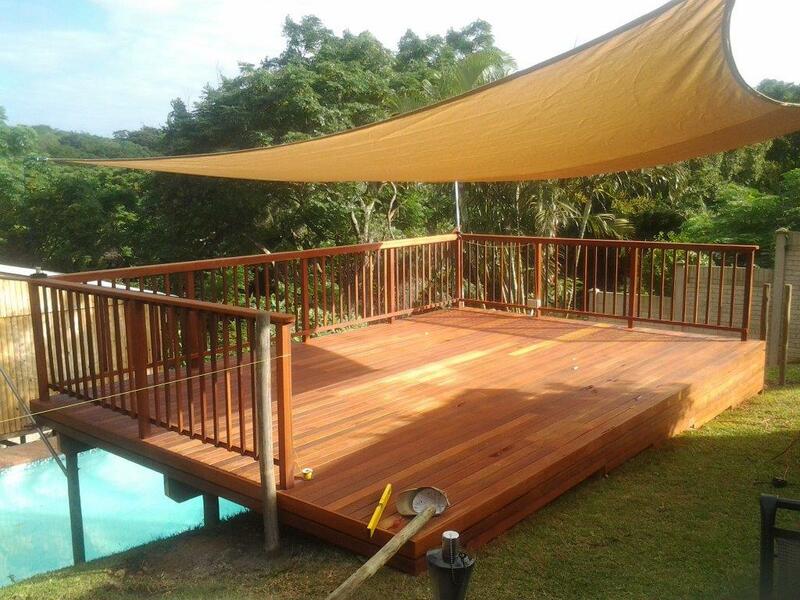 For a free no obligation quote on your wooden decks, pergolas, walkways, balustrades and other outdoor timber construction please contact us on 031 – 762 1795 or use the contact us form below. This article will focus solely on reducing rot in wooden sun decks rather than a specific article on a job we have completed. One of the first questions that are asked when planning to build a wooden deck is that of maintenance. Being wood, the deck will always be susceptible to rot and insect infestation, but with the proper care this can be reduced to the absolute minimum and can compare favourably, if not better, to using other materials such as composites, concrete and tiles. Let’s face it when it comes to aesthetics and warmth wood is best, but often people opt for other materials simply because there is a belief that they are easier to maintain and will cost less in the long run. Rot is caused by a break down in the fibres of the wood. A breakdown in the fibres of the wood is caused by algae being allowed to grow on the timber which in turn is caused by water. Water therefore does not directly cause rot. A piece of wood can live in water all its life and not rot, but if it is not cared for properly then it will cause algae to grow and ultimately rot. CCA Treated timber of course eliminates this because it contains copper which prevents algae from growing. However it is only possible to CCA treat certain timbers such as pine and to a degree Saligna because of the differing densities of the woods. Pine is soft and balau is hard. CCA treatment is done through pressure treating (vacuum) and it is therefore impossible to CCA treat balau as it is too hard for the solution to penetrate the timber. So how does one reduce the chances of balau rotting? Well first of all balau is naturally resistant to rot because it is twice as dense and twice as hard as pine for instance so the water doesn’t penetrate it as easily. Also it contains natural oils and resins which repel water. So it will rot, but it will take longer than other timbers. A piece of wood, any wood, takes in water largely through the end grain. Very little water is absorbed through the face or side grain. Think of it as a bunch of straws. When the straws get wet on the ends they can take up water, but they can’t take up water through the sides. So the important areas of your deckboard is of course the ends, or end grain. Where a deck board is cut, there is not much that can be done to stop water ingression except to seal it with a suitable water-repellent sealer after or during installation. When a deckboard comes from the timber yard it is often closed off on the ends with wax. However that board needs to be cut in order to fit into the deck so one end will always be wax free. Also it is not advisable to leave that wax on. In the hot sun the wax starts to melt and leaves unsightly marks on the joins. So it is best to cut the wax off before installation. That leaves two ends exposed which now need to be sealed off as best as possible using sealer. Apply it liberally to the ends and make sure they are re-sealed during maintenance intervals. The other area that is vulnerable is where the screw hole is drilled through the deckboard to attach to the joist. 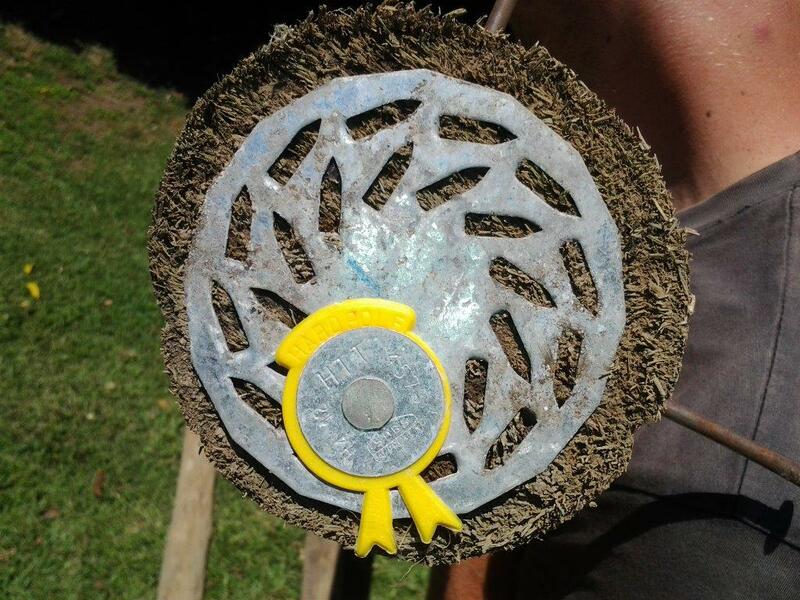 This leaves a hole where water can penetrate the end grain on two sides. What compounds this problem is that the screw is normally counter sunk which allows water to collect in the hole and be absorbed up and down the end grain. Some deck builders use a stop bit to insert the screw whereby the screw head stops at the surface of the deck. I don’t however use this method for two reasons. Firstly the screw is now not tight up against the bottom of the counter sunk hole so the board may work itself loose over the years. Secondly, there is still a small gap around the screw head for water to get into and move along the end grain. And trust me water will find that hole. You will often see deckboards that have started rotting at the screw holes. Now you know why. Instead I counter sink the screw hole about 5mm, insert the screw and tighten it until it is tight right up against the bottom of the hole leaving the screw head counter sunk a few millimetres. I then take a clear epoxy, mixed with the sawdust of the same timber to match the colour, and force it into the hole leaving it slightly proud. Try and use a very fine saw dust. It makes mixing the epoxy much easier and it goes in the hole better. Once it is dry, I use a grinder with sanding pad to flat it and then I use a rotex sander to remove the scratch marks left by the grinder. Now it is ready to be sealed and good luck to any water that thinks it can get in there. The epoxy is the only filler that will last. Wood filler will pop out in a few months’ time. Use a clear epoxy as the saw dust will match the colour of the deck. White or grey epoxy will leave a white or grey mark on the surface. It takes more effort and takes longer to do it this way, but my crew has it done to a T now. And the net effect is a better built deck that will last longer and will cost less to maintain. So there you have it, the warmth of wood without the hassle and without having to settle for alternative materials. For a free, no obligation quote or for some advice please feel free to contact us on 031 – 762 1795 or complete the form below and I will contact you. Please also feel free to leave comments below. Jacuzzi cladding is a nice job to get hold of because it allows one to use up a lot of off cuts that would otherwise be useless in building say, a 20 square metre deck, as most of them are less than 1m in length. 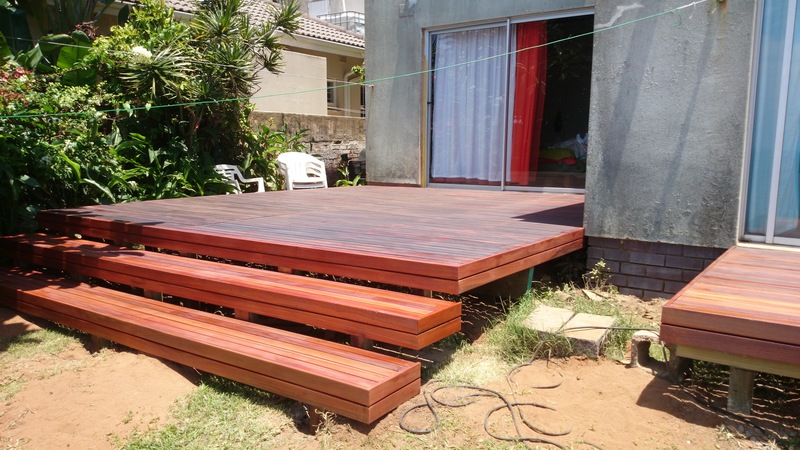 A lot of wood is wasted when erecting a wooden deck because one will order a 3.3m piece of timber and only 3m or 2.9 will be required. Or the lengths required are not available from the supplier so a longer piece needs to be bought. Cladding Jacuzzis allows one to use these off cuts in the substructure and thereby recover some of the cost of the waste. The timber is still new and is not compromised and would need to be cut to that length anyway (so sorry no discounts because of this). 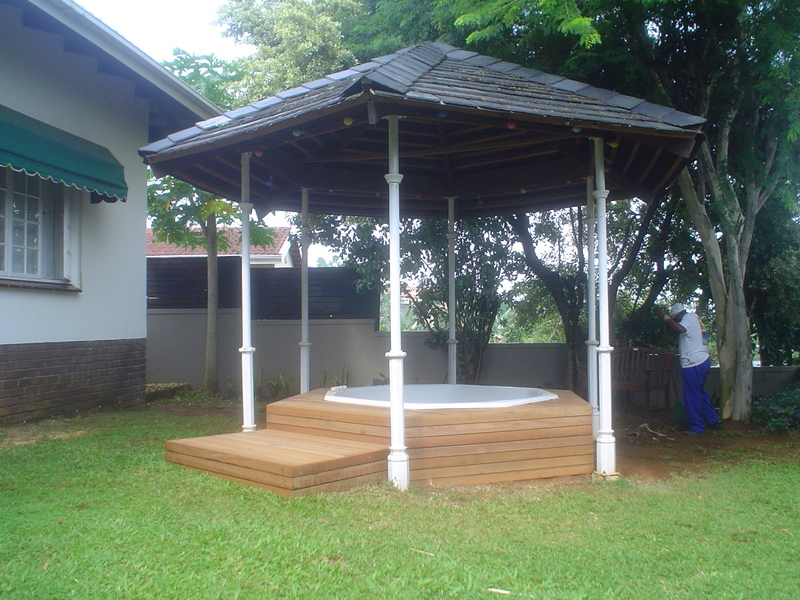 This Jacuzzi cladding was fairly simple in that there was an existing structure there that had deteriorated and was therefore removed and replaced with exactly the same shape structure. So there was no thinking involved really, we simply made sure that the existing structure was correct in its dimensions and then we replicated what was there. When constructing these types of decks or cladding structures it is best to try to keep the deckboards running in the same direction. To make the deck boards all run parallel or perpendicular to the pool or Jacuzzi would be very tricky and may result in errors. 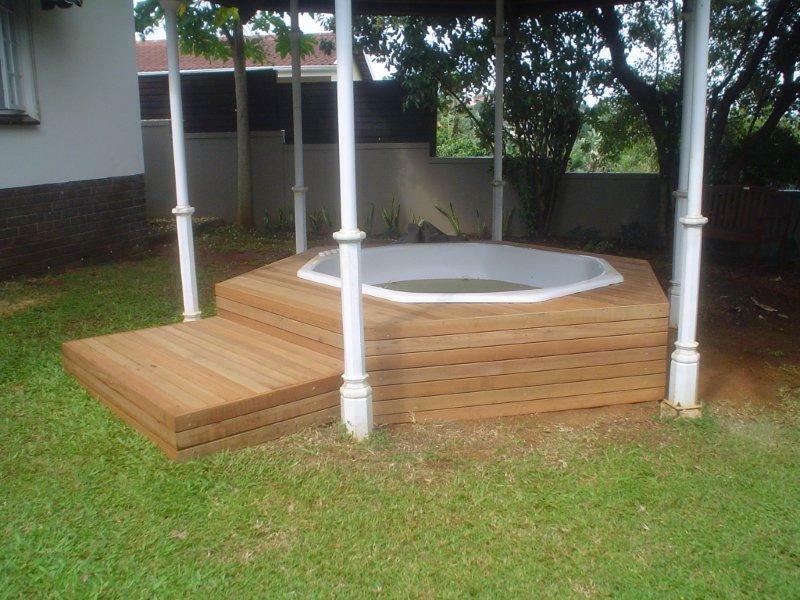 Having said that we are busy with a wooden deck now in Westville where we have kept the deckboards parallel to the pool on all sides for various reasons. I will update you once that is finished, with pics. The structure of this cladding went on well and we then clad it with normal standard deckboards. We created a 1m² step or landing so that once people had finished in the Jacuzzi they could dry off on this landing without having to try to balance on the edge. It provided a nice platform that remains relatively dry. The shelf or step on the side of the Jacuzzi provided a nice ledge to climb in and out of the Jacuzzi with and to place drinks or snacks on while relaxing. All screw holes were plugged with a mixture of clear epoxy and saw dust (to match the colour as closely as possible) and then sanded flat. It was sealed using Timberlife Satin Wood Base 28, an outdoor wood sealer suitable for woods of low porosity. Maintenance is therefore kept to a minimum as this product penetrates the timber and does not dry on the top as do most shop bought sealers. The timber can be left unsealed but it will turn grey and any sealing thereafter needs to be done carefully by bleaching the timber first to get it back to its natural colour. I haven’t done many Jacuzzi cladding jobs, but as mentioned above it is a useful way to get rid of off cuts that would otherwise be useless in a larger wooden deck. Our other use for off cuts is shower duckboards and pot plant holders, for the much smaller pieces. They keep the pot plants off the deck which prevents that piece of the deck being exposed to excessive or continual wet. The duckboards are useful for getting in and out of the shower. We sell those at the cost of timber in an effort to recover a bit on the waste. For a free quote or advice on your wooden deck or Jacuzzi cladding please complete the form below and we will contact you. Or you can call us on 031 – 762 1795. 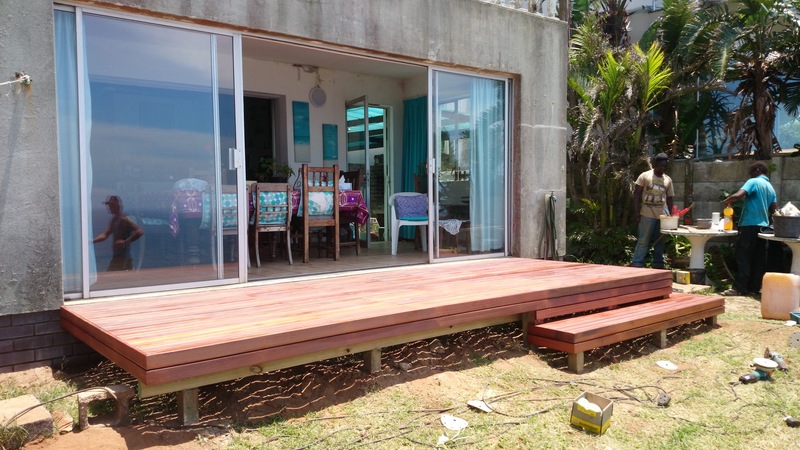 We built this wooden sundeck in Toti using CCA Pine, for the first time, as our substructure and decked it using balau deckboards. For a long time I have been using only balau as a substructure. But after some careful investigation I have accepted that a CCA treated pine substructure is as good if not better than a balau one. The manufacturers of the solution that is used to pressure treat the timber guarantee their product for between 30 to 50 years depending on which manufacturer you use. Provided the company doing the pressure treatment treats it correctly and provided the correct Hazard Level (H level) is used in the correct application, the timber will be guaranteed against rot and insect infestation by the manufacturer of the solution. I will write another more detailed article on CCA pressure treatments, but for the purpose of this article you will need to know what it broadly means. H2 CCA Treated pine is good for roof trusses where it is not exposed to the elements such as rain. H3 treated is good for outdoors such as decks and H4 is good for in the ground or in contact with wet soil. H5 is good for in salty water and is normally a combination of CCA and creosote treatment. H2 is commonly sold off the shelf at most timber yards. H3 and H4 is more specialised so one needs to find a supplier who is regularly treating to H3 or H4. Under no circumstances should H2 be used as a substitute. It will rot within a few years. Simple. Do not use it in decks, keep it for the roof. 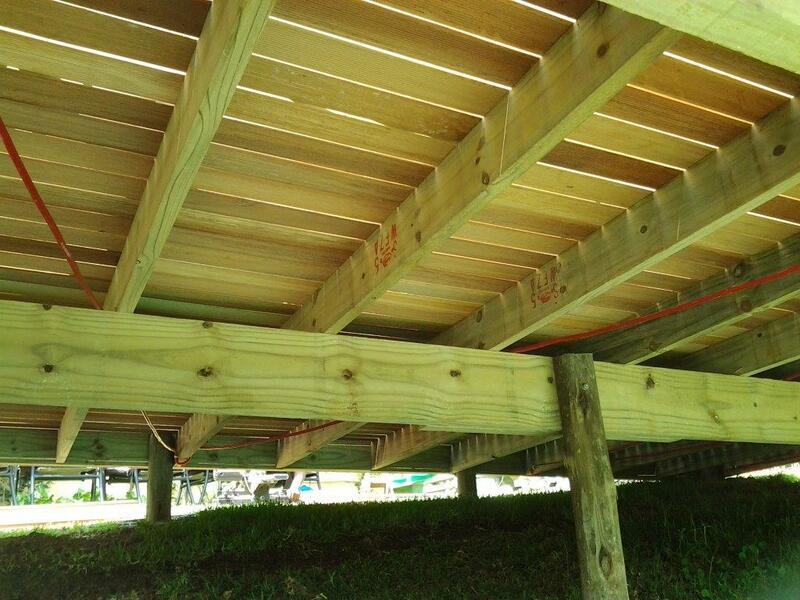 In order to activate a guarantee against the manufacturer one would need to take photos of the deck going up ensuring that the correct H level is used, an audit process would need to be completed on the company treating the timber and the build would probably need to be registered with the manufacturer and possibly inspections conducted during the build. So although it is possible to activate a guarantee, it is not really practical as the substructure will go up in 2 days and the deck will be done in 5 days. However, if the manufacturer is willing to offer this sort of guarantee, then we can safely assume that the timber we are using will hold up to its promise. In a nutshell, H3 or H4 treated CCA Pine is suitable for a substructure for a deck and may very well outlast a balau substructure. I would not be too keen to use it as deckboards for two reasons. Although it won’t rot or get eaten by ants, it will expand and contract a lot more than balau which will result in checking, cracking, warping, bowing etc. over time. The second reason is that because it is half as dense, one needs to use a 32mm thick deckboard as opposed to a 19mm deckboard in balau. So twice as much timber is used and the cost is actually slightly more in pine per square metre than balau. So why not use balau in the surface? It is much better looking and much more stable (i.e. it remains flat for many more years). The cost saving in using CCA pine vs. balau in the substructure is great and this allows me to keep my prices low whilst still providing a quality product. The CCA Pine will last as long if not longer than the balau substructure if the correct H grade of CCA pine is used. All areas that have pine exposed are clad with deckboards so that the pine is not visible. Balustrades remain full balau. For a no obligation quote on wooden decks, balustrades, pergolas and any other outdoor timber construction, please complete the form below and I will get back to you. Or you can call us on 031 – 762 1795.